I love to compose love poems. In fact, I just love to write about love, whether it’s in quotes, poems, teachings or stories. Love, including romantic love, reminds me of God and it’s no surprise ’cause the Bible says He is love (1 John 4:16). And He loved us so much, He came in the flesh to die for our sins (John 1:1, 14, 29; 1 John 4:10). Love can sometimes be as incomprehensible as God. It can also be gentle and yet powerful. Remember the account of Elijah the prophet at Mt. Horeb waiting for God. (1 Kings 19) There was a violent wind, an earthquake and a fire, but God was not in any of them. Finally, a still small voice was heard and that was God! Awesome! ...Love doesn’t always come in Hollywood wrappings When you least expect it, it can sneak up on you.... So true! I love these lines!? I'm glad you do, Ozor! Have a beautiful Sunday and a blessed week! Wow!!!! Lovely.... Am in love with this poem. Nice one ma. Thank you, my dear, and remain blessed! Thank you, Iheanyi! You are richly blessed in Jesus' name. Thank you, Ebere. You are blessed in Jesus' name. God is love and as a result we need to replicate same to others unconditionally, the best way to attract other people's love is by loving others. Thank you ma. Yes, what we sow is what we reap. Bless you, Benjamin! This poem is one in a million.. Every line is so true n lovely.. Chukwu gozie Gi, Ma. Love as a phenomenon is just something above us. Where it is concerned, we are just helpless, because even Hitler must have loved something or someone. I've come across some who swore not to love anymore because of a heartbreak, but when love came knocking, they could not help but open their hearts to let him in. such it the tale of Love the divine. Nice post. Can we really not resist love? Hmmmm! Nice comment, though! Yeah! Makes no sense sometimes but we must also distinguish between infatuation and real love. I love this. Indeed, love comes softly, in some cases, you see your self developing an unusual feeling for someone you never imagined a mere friendship with. But anyway, that's the spirit of God in us: spirit of love. Yeah! That is why it is not good to despise anyone before you become the dog that goes back to its vomit or better still, aku fechara daara awo. Lol! Love you back, Florence! Love is exciting and powerful indeed! Have a beautiful weekend and remain blessed! I am partial to that poem too, even though I can say the same for many others I've shared here and there. Love does take us unawares sometimes. And you're right. There's no love than the love God has for us. Bless you! This is awesome; I love it. Well done ma'am. I'm glad you love it. Cheers! The love of God is the greatest love ever. Bless you ma for this wonderful poem. Bless you too. Though the poem is largely about human love, every discussion of love takes us back to God who is love Himself. Awesome. This is true, we don't plan on how to love before we start loving. It's just like a careless seed planted without plans. But truly Love is indeed a beautiful thing to experience. Love not in Hollywood Wrappings? It can't be so! But the plainly wrapped ones are the most honest I think! Great lines Edith. Yeah, April! Often, we get sucked into the hype and start playing catch up to movie magic love forgetting that that stuff collapses like a pack of cards. Glad you visited. You're such a lovely friend, praise God. Stay fabulously blessed in Jesus' name. Lol. Yh, love can sneak up on u! Interesting lines. Nice poem. love is an uncontrollable feeling no matter how you want to hide from it it always comes back.For those in love , when you see the ones you love, the feeling just keeps bobbling up. This short poem throws a light on how love creeps into the heart of a person.It starts like a creeping plant and firmly plants its roots deep in the heart of one. Love happens unexpectedly. Wonderful piece Ma! Love is a mystery.It is true that love comes softly and sometimes strong. In fact the poem is really interesting and captivating. It teaches quite a lot . Some people feel that when love comes, it does so strongly. This poem emphasizes that love someimes takes a gradual process, it doesn't just come at once. Well, it may be gradual, but it ends up strong all the same. You are lifted, Esther! True oo... Love does exist and it doesnt always happen like those hollywood wrappings. Love takes time-it grows; we dont decide on how or when we love; it's just something that comes or happens unawares. Love is a beautiful thing that everyone should wish to experience. "Love may be challenged by your plans and expectations But in the end, it’s amazing and intoxicating as it should be". I love those lines. Love is beautiful! Especially that which comes off sincere and true! It can make one act, speak or react in ways he/she ordinarily wouldn't!! Nice piece ma. I feel that love can be embarrassing, you fine your self doing things outside the ordinal, but after which you will be glad u did. Love is spontaneous and adventurous, it takes wisdom to embark. Love is joy. Love is pain. Love might not always be rosy, but it's worth it. Lols, sure i agree with you, most times love takes time before it comes and then we will feel we dont have heart at all, and wonder why its time to love, not understanding that love comes slowly and it cant be pushed which depicts its softness, most times it is also developed, but in all it comes in a soft manner. 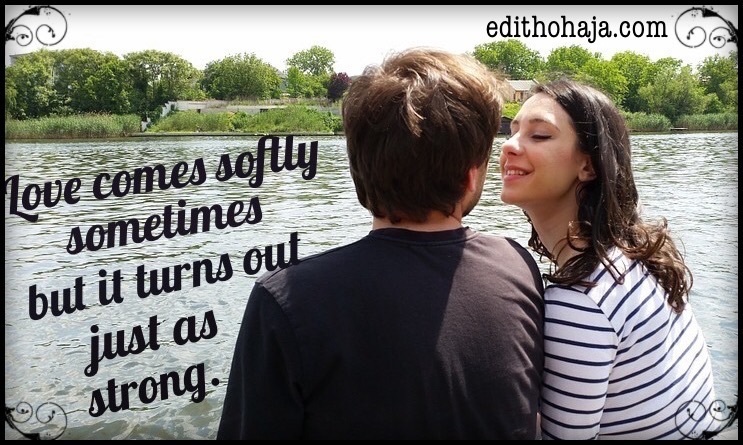 No doubt, "love comes softly sometimes but it turns out just as strong". This is a very nice poem because love is essential but many do not understand it. Love may be challenged by your plans and expectations but in the end,its amazing intoxicating as it should be.I love that! That's true. Love comes to us in ways we least expect and through people we never dreamed of meeting. Some breath taking while some are not . all the same it is most rimes exactly what we need if only we would look within. I agree with you ma.Just like a cool breeze it comes within the twinkle of an eye it carries you like hurricane. I am so in love with this post, every line speaks truth about how love catches you unaware, when u least expect it and with the most unlikely person. People fall in love everyday but only a few can acknowledge what it is. I love this post because it reminds me that all has felt the bite of love and just like a thief, it comes and steals your heart away when you least expect it , leaving you lost and confused. Thank you so very much ma.. Very nice, i really enjoyed it, its so pure and true, there is power in love but God's love is the best. Love can be captivating especially when is with the right person. It may seem hard but with time it grows to something spectacle. No love can be like that of God towards his children. Nice one Ma. Love has not one definition. One said it is a craving emptiness that needs to be filled. Another said it's an illogical feeling that endears him to someone. That's why some say it is blind. Love enters the mind sometimes like a trail of water that gradually fills a cup. Sometimes it cannot be predicted. It comes gently as the name sounds. Love is divided to many kinds. But what matters here is that it powerfully dwells within us. Everybody can love because it is our nature. Just like God, our maker is love. Love cuts bonds, classes and sizes. It flows in the little things we don't expect. It can come instantaneously or gradually, however, it is beautiful. Love is the most beautiful legacy God gave man. I picture Love as a balloon which we set off, and it mostly lands on the unlikely of persons. Nevertheless, It is a beautiful feeling to be in Love. That tingling feeling is worth it. Love is beautiful. Love is happiness. It's something l pray for everyone to experience even if it's for a short while. You will never understand it until you experience it. love is something we can't do without......so,you have to love so that you will be loved. Love is everything It feels good to love and be loved. Love is a beautiful thing. I love you, ma, for this piece. Thanks for dropping by, my beloved sister. I pray peace and overflowing joy upon your life in Jesus' name.